The involvement of global consulting and auditing giant KPMG in the endemic corruption that besets the government of South Africa has had a terrible impact on its local operation. As its part in the cover-up was revealed in recent months, a number of top KPMG officials have been forced to resign. It has lost numerous corporate and state enterprise clients, and KPMG’s reputation, above all, lies in tatters. Responding to the cascading political and business scandals, on Oct. 16 the Southern African Catholic Bishops’ Conference called for an anti-corruption court to be established in South Africa. The chair of the Justice and Peace Department, Bishop Abel Gabuza, said: “The moral fiber of our nation has suffered massive damage as a result of people losing confidence in the office of the president and its ability to fight corruption at all the levels of government. For eight years, we have not had a president who leads credibly from the front in the fight against corruption. He noted that several countries in the world already have such courts in operation. KPMG South Africa had audited South African companies owned by the now Dubai-based Gupta family for 15 years. It withdrew from the relationship in March 2016 following a deepening scandal centered around the claims of the Gupta family’s “state capture” of government regulatory bodies and its cozy relationship with President Jacob Zuma. Mounting evidence suggests that there was more to the relationship between KPMG and the Gupta group than strictly business. Top KPMG executives attended a Gupta family wedding at the Sun City Casino and Resort in the North West Province in 2013. KPMG now admits this friendly contact was probably inappropriate. The event became associated with a swathe of political and financial scandals. Visiting members of the Gupta family were even allowed (at the behest of Mr. Zuma) to enter and leave South Africa privately via a military airbase near Pretoria. In effect they had been granted a kind of diplomatic status they should not have. This was illegal. Part of the financing of the wedding seems to have come through the Free State provincial government via companies owned by the Guptas. This was also illegal. Such corporate irregularities should have been picked up by KPMG audits in 2014. They were not. Could plain old bad auditing on the part of KPMG and poor judgment on the part of some of its leadership have led to these errors and oversights? 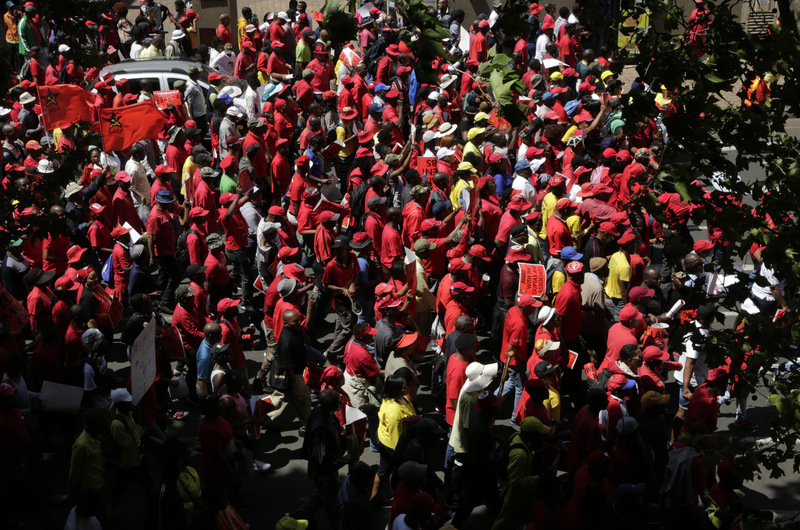 Not likely, a South African watchdog organization Corruption Watch says. It reports that KPMG has benefitted from corrupt and illegal cash flows between the government, the ruling African National Congress and South African big business. Corruption Watch alleges that KPMG “auditing” deliberately covered up corruption. KPMG also stands accused by civil society organizations of participating in the process that led to the dismissal of the former South African finance minister, Pravin Gordhan. One of the strategies the state used to get rid of the highly principled Mr. Gordhan was to discredit him through accusations of a “secret” South African Revenue Service intelligence unit acting outside the law. Mr. Gordhan had, formerly, headed the service. The report, which KPMG now acknowledges was subpar, was used as a basis to allege that Mr. Gordhan and his team needed to be removed. Critics charge that this political smear campaign was a step toward “capture” of both the Ministry of Finance and the Treasury by the Zuma government and the further looting of public assets. While denying any criminal activity, KPMG has recognized that it made many mistakes. But these mistakes have been costly. Save South Africa, a civil society organization working against state capture, has called on South Africa’s businesses to sever ties with KPMG. A succession of companies—both public and private—have done so. Among them are Sygnia, SasFin and the Foschini Group. Ironically, so has TelkomSA, the parastatal communications company, and South Africa’s Parliament. But 70 major corporations have not, possibly adopting a wait-and-see policy in anticipation that KPMG will be able to clean up its act. KPMG has promised to do so. Its South Africa C.E.O., Nhlamu Dlomu has admitted his firm should have seen red flags in some of its questionable auditing. KPMG has also disavowed parts of its South African Revenue Service “rogue unit” report. The current S.A.R.S. commissioner, Tom Moyane, is threatening a lawsuit against the company. Meanwhile KPMG has appointed nine new executives to lead the company through the crisis. Some wonder, however, whether the damage is repairable. KPMG prides itself on its integrity—whether in auditing, tax advice, risk management or advice on corporate deals. It has stood solidly behind successive King Reports on Corporate Governance, a series of documents developed in South Africa that have become something of an international gold standard to promote ethical corporate governance. Most recently it has promoted the latest version, King IV, on its website. Whether one reads the whole affair as a tragic case of poor judgment (and sloppy work) or part of a pervasive corrupt political and business culture in South Africa, the picture is bleak. First came the Bell Pottinger scandal. Now KPMG, and on the horizon are questions about McKinsey. He congratulated them: “You are starting to connect the dots. There are many more to connect still.” The word “starting” is ominous. In the aftermath of these revelations, the South African Supreme Court ruled that a decision by the North Gauteng High Court in 2009 to drop 738 charges of corruption, money laundering and racketeering against President Zuma was “irrational.” This means that Mr. Zuma can be charged again. But the head of the National Prosecuting Authority, Shaun Abrahams, a Zuma crony, seems unlikely to allow this to happen. And therein lies the problem with Bishop Gabuza’s appeal for an anti-corruption court. Any case in South Africa that might reach it must first go through the N.P.A., an enforcement agency that appears to be “captured” by the president’s office. This article also appeared in print, under the headline "As scandals proliferate, South African bishops seek an anticorruption court," in the November 13, 2017 issue.